I’ve previously written about how much I love Lemon Chicken and that I grew up with it. It’s the one dish that makes me miss my homeland, especially my grandparents. The Boy (bless his heart), knows how much this dish means to me and he tries his best to recreate this dish so that I can walk down memory lane more often. It’s funny how much food speaks to me. Even as I am writing this post, I’m dreaming of the past, of younger years and of more carefree days, when all that mattered was if I was going to get a second bowl of rice with my lemon chicken. This dish takes the classic Lemon Chicken dish and turns it on its head. We bring to you, Lemon Chicken’s Long Lost Cousin. Serve with a warm serve of rice, noodles or any handy carb laden produce you can get your hands on. The sauce is just floral and slurpilicious! Marinate chicken with salt, caster sugar, pepper, sesame oil and Shaoxing wine. Place in refrigerator for 4-5 hours or overnight. Take both marinated fillets out and let stand till they reach room temperature. Whisk egg whites until frothy. Dip chicken into the egg whites and into the cornflour and tapioca flour mixture. Fry each side for about 3-5 minutes (depending on the thickness and size of the fillets) until golden brown. Drain on wire rack and let them rest while you prepare the yuzu sauce. Combine yuzu juice, lemon zest, chicken stock, white vinegar, sweet sherry and caster sugar into a saucepan and heat over low heat until sugar dissolves. Taste sauce and adjust accordingly (more sugar or yuzu juice to balance the sweetness and sourness). Add in slurry and stir for another 1-2 minutes until the sauce thickens. Add in cucumber chunks and turn heat off. Set sauce aside. Slice chicken into strips and arrange on plate. 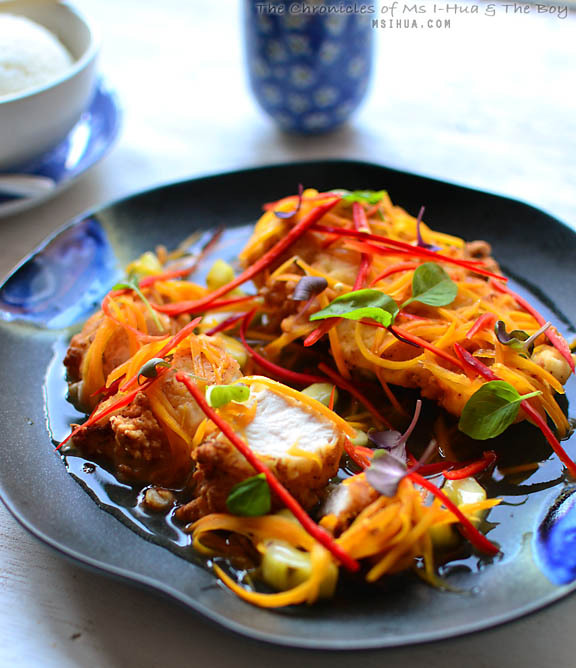 Pour yuzu sauce over and garnish with shredded carrots, sliced red chillies and micro herbs. Serve immediately. So what do you think folks? 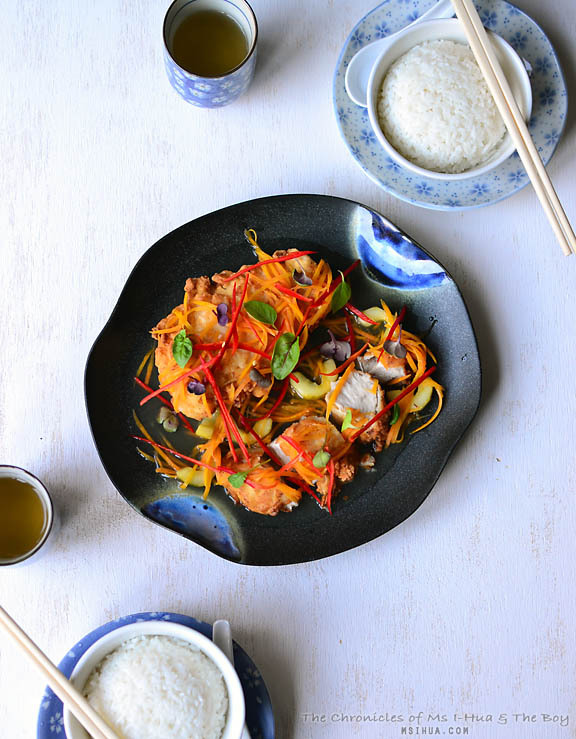 Are you in with us on our journey to modernise traditional Chinese dishes? Ooo.. what is this dry fried spicy lamb? Sounds delicious.. must try to find out and recreate! It is much tastier than lemon too! I love lemon chicken too, although I somehow feel it’s a bastardised Chinese dish. It’s so hard to come across a good lemon chicken, most places have thick floury sauces with the wrong balance of sugar and lemon, urgh!!! The use of yuzu is a fantastic idea! Yayy to this. I am salivating as I type this! omg yuzu fried chicken sounds brilliant and amazing! where has this been all my life!